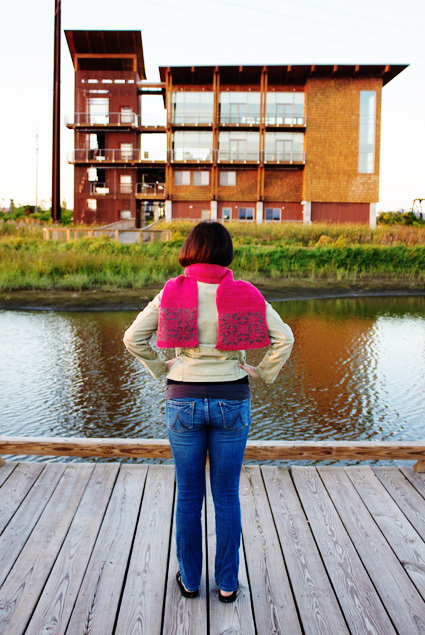 I designed this scarf when I was studying in Strasbourg, France. December in Strasbourg is abuzz with a Christmas market, German and French tourists, and blasts of arctic air. The secret to surviving the holiday season is generous servings of tarte flambée, plenty of mulled wine, and a thick, woolly scarf to keep your neck toasty as you ride your bike through Strasbourg’s narrow, cobblestone streets. To keep myself warm while fitting in with the cosmopolitan students and professors at my university, I developed this ribbed scarf using a unique stranded technique to make it reversible. 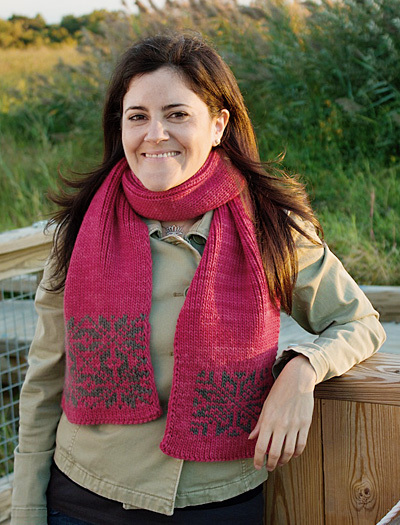 Each side of the scarf has a different traditional Fair Isle pattern. The challenging part of this scarf is following the chart, because it doesn’t look like it makes sense on paper. 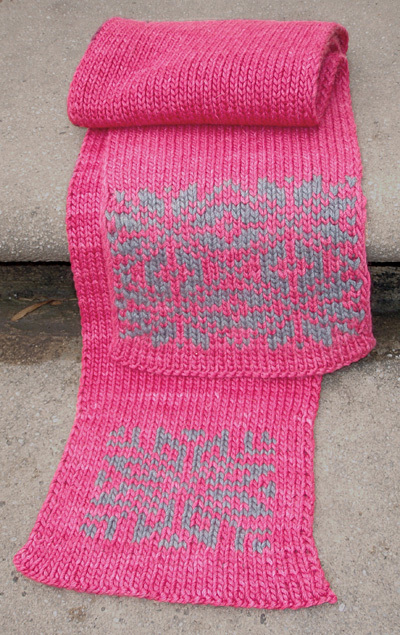 But once you work a few rows, you can see the lovely Fair Isle snowflakes taking shape in your knitting. Note: Gauge given is approximate. It is not critical to achieve the given gauge for this project; however, you should use needles that are slightly smaller than the recommended size for your yarn. Gauge given by the manufacturer for the yarn used is 16 sts = 4” in stockinette st using US #9/5.5 mm needles. RS Rows: [K1, p1] to last stitch, k1. 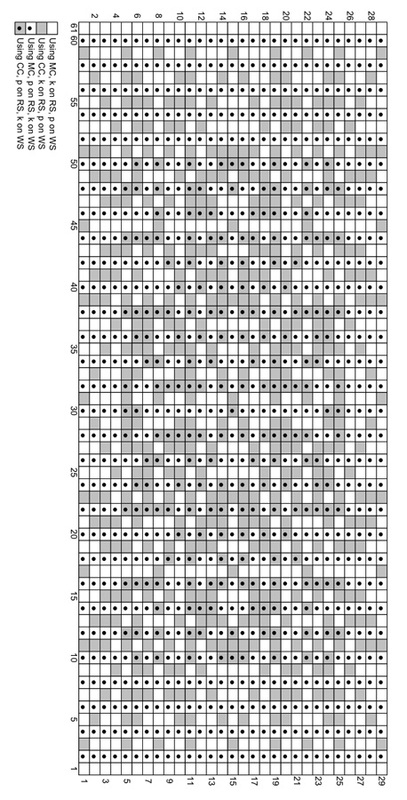 WS Rows: [P1, k1] to last stitch, k1. Instructions for the Long-Tail Cast On method can be found here. Using long tail method and MC, CO 61 sts. Work 4 rows 1x1 Rib. Mark RS of work. Even though scarf is reversible, it is important to keep track of RS and WS when following chart. Work Rows 1-29 of chart. Important: When knitting a st, hold yarn not in use to back of work. When purling a st, hold yarn not in use to front of work. Using MC only, work in 1x1 Rib until work measures 58 inches, or approx. 6 inches less than desired length, ending with a WS row. Work 4 rows 1x1 Rib using MC only. BO all sts in pattern. Weave in ends. Block very lightly, if desired; be sure to leave ribbing fully contracted, as any widthwise stretching will distort appearance of color pattern. 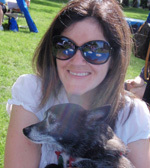 Meghan is a long-time knitter and runner, an avaricious reader, and a frequent traveller. And a lawyer. And sometimes she swims with sharks. She can be found on Ravelry as themegnapkin, and on her blog.